Anyone with a genuine passion for whisky loves reading about it almost as much as they enjoy drinking it. 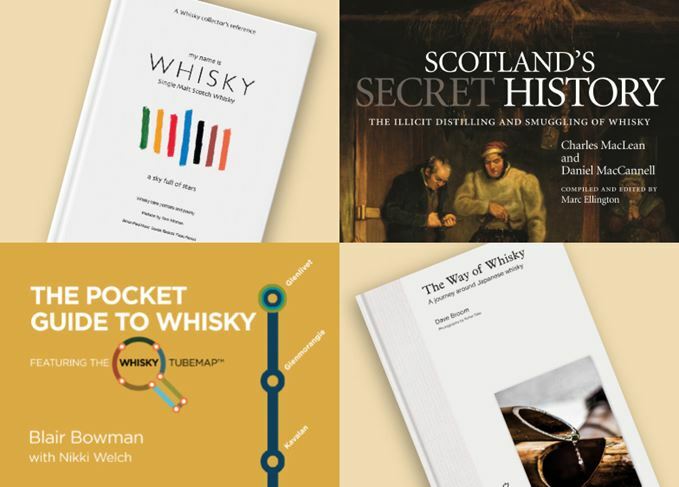 So, if you’re looking for the perfect book to give the whisky lover in your life this Christmas – or you’d like to treat yourself – here’s Tom Bruce-Gardyne with a few of his own personal recommendations. Italian whisky writer and blogger Davide Terziotti has produced a monumental pictorial work, My Name is Whisky (M Book, €89/£79), with a stream of life-size colour plates of some of the rarest and most beautiful whiskies ever made. These are interspersed with black-and-white portraits of the characters involved, followed by lengthy Q&A interviews. Some readers may never get beyond salivating over the bottles, but the interviewees range from legendary collectors, such as Giuseppe Begnoni and Max Righi, to indie bottlers including Hunter Laing and Gordon & MacPhail. There are also a number of whisky ‘national treasures’, from Bruichladdich’s former distiller Jim McEwan to Whyte & Mackay master blender Richard Paterson. The next page shows two virtually identical bottles of 18-year-old Macallan Gran Reserva, one authentic, one fake. Whoever did this work of sofisticazione, as they say in Italy, was extremely good. With his infectious curiosity, it’s hard not to be swept along by Dave Broom in The Way of Whisky – A Journey Around Japanese Whisky (Mitchell Beazley, £40). He leads us from the tiny White Oak distillery in the south to Nikka’s home of Yoichi in the far north, in an attempt to discover what makes Japanese whisky ‘Japanese’. Yet this is far more than a distillery tour, for Broom believes the secret to his quest lies in Japanese culture as much as in the subtle differences in distilling and maturation, or the effect of climate. Fittingly, the journey ends with a section on the Japanese ethos of kaizen – continuous, incremental improvement, which applies to everyone with a craft, from woodworkers and weavers to distillers and bartenders. In The Illicit Highland Whisky Still, painted by Sir Edwin Landseer, a kilted Highlander sits in his bothy, surrounded by his family with a freshly-killed stag at his feet and a barrel slowly filling with moonshine. This evocative painting that did so much to help seduce Victorians into the earthy, homespun spirit of Scotland pops up in the centre of Scotland’s Secret History by Charlie MacLean and Daniel MacCannell (Birlinn, £14.99). It’s an obvious if misplaced image for a book that delights in debunking the romantic myths around smuggling. Far from being on the fringes, it was right at the centre of Highland life. It ‘operated on a massive scale’, writes Marc Ellington in the introduction, involving everyone from local crofters to merchants and civic authorities. MacLean leads us on a detailed history through to ‘the last gasps’ of illicit distillation in the late 19th century. Then historian MacCannell zeroes in on the Cabrach, a hotbed of smuggling in Aberdeenshire. The book ends with a quote from an excise officer bemoaning Scotland’s 4,000-mile coastline and the bands of ‘unscrupulous, ruthless people who peddle their trade. They are full of guile, subterfuge, and they are very, very difficult to catch’. The date of the quote? 1996. Designed to fit all but the meanest stockings this Christmas is The Pocket Guide to Whisky by Blair Bowman and Nikki Welch (Birlinn, £7.99). Employing the same, simple, Tube map-like graphics first used by Welch in her popular Pocket Guide to Wine, the aim is to help whisky virgins jump on board. If you’re at station Glenfiddich, one of four ‘starting-points’, you can head south on the ‘heart line’ for ‘more of the same’ like The Glenlivet, or north for something sweeter like Kentucky Straight Bourbon. Regular readers of Scotchwhisky.com probably don’t need to know if they’re on the ‘easy loop’ en route to Monkey Shoulder or the ‘decadent line’ heading for oblivion. But, for any friends trembling on the edge of planet whisky, they may well be grateful for this fun little guide to gently ease them in. Looking for the perfect whisky gift for your Secret Santa? Don’t worry, we’ve got your back.